Lighting costs are one of the most serious financial items in the budget of many cities and enterprises. SolarEntarprise Ltd. offers solar lighting that would be economical in many aspects, not only where the electricity supply of the area is too expensive but also where the investment depends very much on the financing of the project. SolarEntarprise Ltd. offers street solar lighting for sports facilities, parks, airports, interurban and urban roads as well as other public, private and military sites. When installing of street solar lighting it is not necessary to dig canals to lay cables for connection to the network of EDC. The daily solar energy is being used to charge rechargeable batteries and the illumination at night is carried out according to the accumulated energy during the day and the capacity of the installed battery. The control of the charge and the use of energy are being monitored by microprocessor controller. SolarEntarprise Ltd. offers solar lamps that are well dimensioned, so we can ensure 96% annual luminous energy. 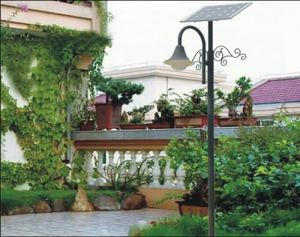 The street solar lamps consist of five main parts: solar panel, illuminant, rechargeable battery, controller for regulation and pillar. We know how to best combine these five key parts to offer our clients a suitable solution to their needs.